Multiobjective optimisation provides the opportunity to trade-off different objectives against each other. The software calculates hundreds of solutions for the network (or even thousands, if required), evaluates them and then presents the best (undominated) for the network planner to make the final choice. The example on the left shows the Pareto front of solutions, with the undominated ones shown in red. The trade-off here is between minimising handovers and balancing call volume across the domains. A further feature is the ability to handle different hardware capacities. 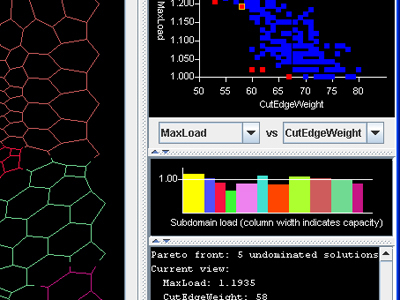 In the histogram on the right, NetWorks monitors the load balance across the domains; the different hardware capacities are represented by the column widths. This is just one of a range of flexible options that aid the network planner to choose the most appropriate solution for any given system. 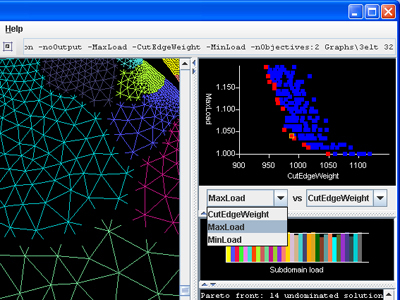 Both example graphs shown on this page are extracted from finite element meshes and are not meant to represent real mobile phone networks.